Happy Thursday, everyone. I am having a great week. Unfortunately most of what made it so great, I can't talk about publicly. (The one thing I can talk about is that yesterday I met John Edwards at a private lunch, and he was awesome, squeee.) Instead of blabbing the other good stuff, I offer you my own handmade Lol dogs art. Whee! Did you just get funding approved to do an ARG that solves global warming? Am I hot or cold here? Its a great feeling to get hooked up on a project you've been preparing for months. Hoping to have that feeling again sometime this summer. 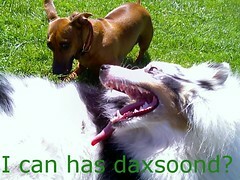 My guess is the LolDogs is a BIG clue, and you've gotten the green light on the Dog Park sim. Can I be first in line to beta test? Is it ethical to play during a time of crisis? Play Now! World Without Oil is LIVE!